Maps of Iowa from MapofUS.org. Includes boundary changes map. Several types of maps are useful for genealogists as they search information in Iowa. Some maps give historical background of the area or show migration routes, such as roads, rivers, and railroads. Topographical, Plat, Land ownership maps plus many others are described in the Maps for the United States. Many maps are in published atlases. Eichholz, Alice, ed. Ancestry’s Red Book: American State, County, and Town Sources. Contains bibliographies and background information on history and ethnic groups. Also contains maps and tables showing when each county was created. Atlases for most Iowa counties begin about 1870 and may contain some biographical information about families in that county. Sometimes they include pictures of individuals and their homes and farms. The University of Iowa and Iowa State University have wide ranging map collections for the state. Iowa maps and atlases are listed in the Locality. My Genealogy Hound has free access to historic county maps for some Iowa Counties. 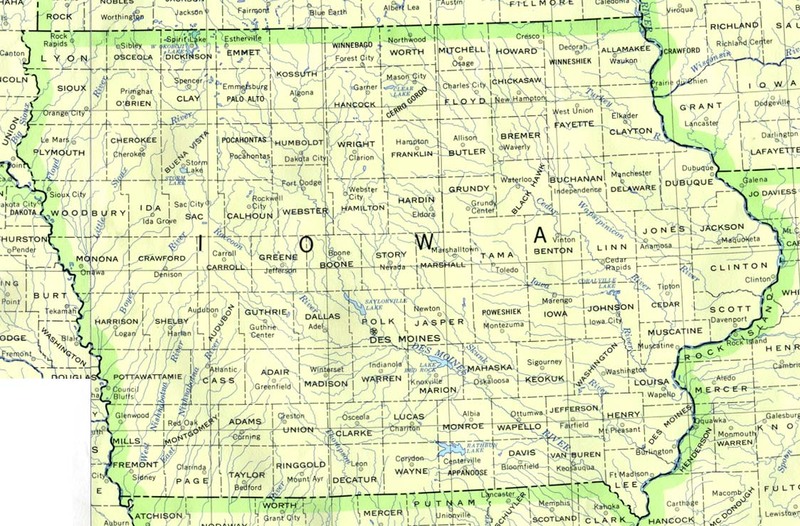 State map of Iowa showing the location of each Iowa County is on Hearthstone Legacy. There are many places to find the GPS Coordinates of a location, cemetery, township, city, etc. One easy website to use is from the USGS Geographic Names Information System (GNIS). The David Rumsey Map Collection contains an extensive collection of historical atlases, maps, and other antique cartographic treasures. Fire Insurance Maps provide a wonderful view of your ancestor's life. The Library of Congress has Sanborn Maps. Iowa Sanborn maps for over 1,000 cities and towns are available online to University of Iowa students and State Library card holders. A list of the maps is available to download through the State Historical Society of Iowa. Andreas, A. T. Illustrated Historical Atlas of the State of Iowa, 1875. This work has multiple filmings. A few maps of early Mormon and other pioneer trails are available at the Family History Library. 1875 Historical Maps this collection contains plat maps for the Counties of Delaware, Jefferson, Marion, Page, Poweshiek and Taylor. 1894 Historical Maps showing counties in the East half of Iowa. 1895 Historical Maps a colorful map shows the entire state of Iowa with the option of viewing each individual state. County boundaries changed often over the years, these maps show the county boundaries for each of thecensus years. Plat and land ownership maps and other types of maps are described in the section of the United States Maps. Topographical maps show physical and man-made features, such as creeks, hills, roads, cemeteries, and churches. FamilySearch Catalog, atlases and maps are both listed under Maps. ↑ Eichholz, Alice, ed. Ancestry’s Red Book: American State, County, and Town Sources. Rev. ed. Salt Lake City: Ancestry, 1992. FHL book 973 D27rb 1992. ↑ Andreas, A. T. Illustrated Historical Atlas of the State of Iowa, 1875 Chicago, Illinois: Lakeside Press, 1875. FHL film 966235 item 1. This page was last modified on 13 September 2017, at 18:47.